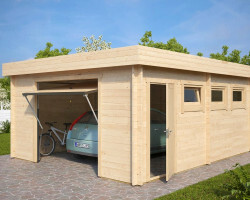 All our garden sheds, timber garages, and wooden carports are natural products made of slow grown Nordic spruce. 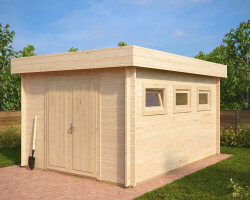 Our flat pack log cabins are the most affordable and easiest way to build your own wooden shed within a day or two. 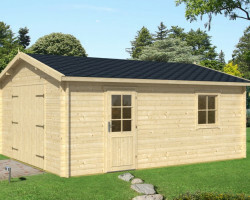 Besides the practical side and functionality, our high quality garden log cabins add natural beauty to your garden. 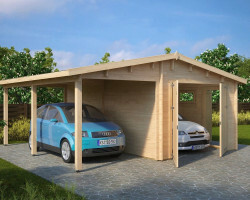 Make sure you check out our combo-cabins including: summer houses with sheds as well as carport-and-shed combinations. It’s a great way to save money and space in your garden. 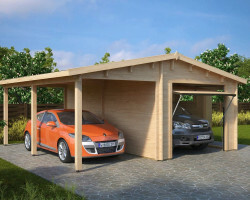 Get solutions for several needs by buying only one garden log cabin. 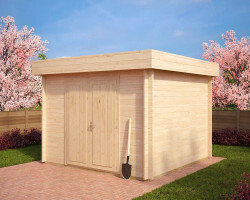 What makes our wooden garden sheds better than those our competitors have to offer? The answer is very simple: We don’t cut corners on the quality or design. Although it is just a garden storage shed or a workshop shed, we think that everything must be beautiful and long lasting in the garden. All our wooden garden sheds have been designed as carefully as our garden summer houses. All of them come with solid flooring and strong 28-44mm thick walls. Our selection starts at 4 m². 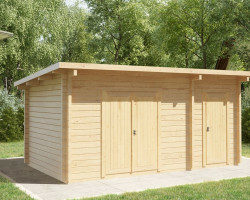 Large garden sheds have up to 12 m² storage space. Many gardens don’t have enough space to set up both a garden room and a garden storage shed and still leave good space for kids to play. Hansa Garden designers are working out more multifunctional garden log cabins for smaller gardens that meet all your needs in one cabin. 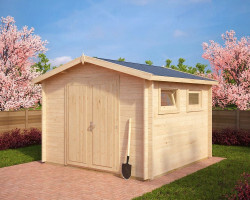 Have a look at our combo-house Paula- a garden summer house with shed. 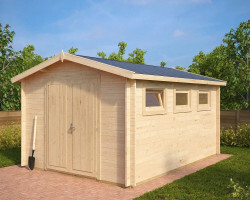 By buying one very affordable garden log cabin, you have a place to relax or work in your garden. You can store all your tools and garden equipment and you have a great BBQ corner with a canopy. 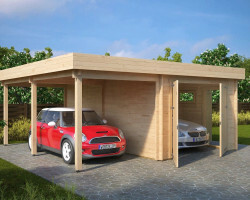 Our wooden garages provide a wonderful, safe place for your treasured vehicles. They still have plenty of space left to store all your tools and other garden essentials as well as a workshop for your DIY projects. 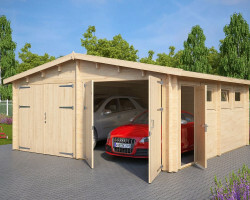 Don’t be fooled by those “buy cheap garage“ offers. 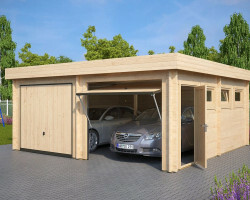 We recommend and supply timber garages with walls no thinner than 40 mm. Most of them come with 70 mm walls. Our wooden garden buildings are all waterproof packed during shipping. They last for ages and continue to look nice. 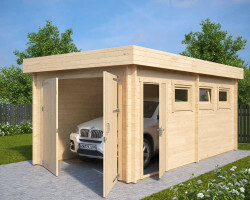 All our log garages are supplied with high quality 40mm or 70mm logs, all screws and fixings, premium garage doors and windows together with detailed assembly instructions. 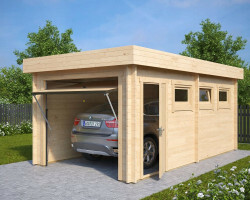 All you need are tools, two adult DIY persons, and two days to install your log garage. 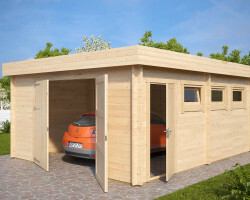 After your wooden garage has been installed, it is time to pick your favorite colours and finish the exterior. We recommend and supply Remmers HK Stain. It is one of the best decorative wood preservative stains you can buy in the UK to paint and protect your timber garage or any other wooden garden building. 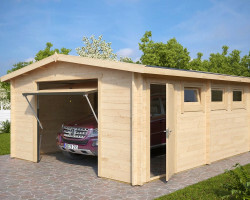 All our flat pack log cabins are supplied with black roofing felt. 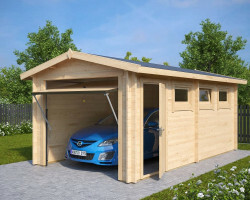 We recommend that you spend a little extra on Icopal roof shingles to upgrade the outer look of your wooden garage and extend life span of your roof. Icopal roof shingles have fifteen-year factory guarantees. They have been tested in the roughest weather conditions of Finland. 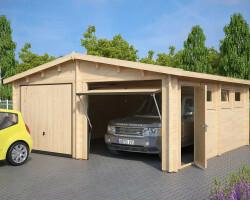 A timber garage is not only a safe haven for your treasured vehicle. 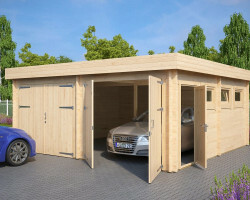 It has space for your DIY projects as well as for storage of your garden equipment. 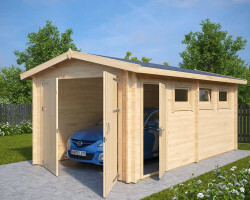 Most of our wooden carports are multipurpose wooden buildings with garden storage sheds for keeping tools and other garden equipment away from weather. They also have a small working space to fix your kid’s broken bicycle or garden furniture before the new summer season starts. 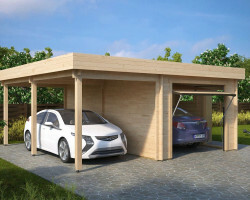 Large carports have space for two cars.